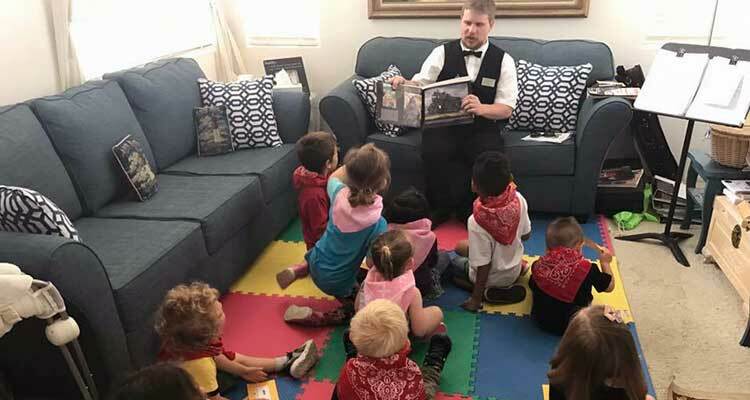 The children were excited to have a real train engineer visit our child care and share about trains. In fact it was an extra special day for us teachers too because once upon a time the train engineer was in our care when he was a child! We wish to extend an very special thank you to Kyle Terpening for taking the time to visit and share. Of course, the children love to play with toy trains and they especially like seeing real trains. I don’t know if it’s considered to be better than the garbage truck, but it’s got to be a close second at the very least:) During Kyle’s visit he shared photos of trains and told stories, all in a manner the kids could understand and relate. As it happened, it was also the letter “T” week and perfect way to focus on learning their alphabet, T is for Train. We drew pictures of trains and the children were also able to dress up like train engineers. Well, at least we had a hat and scarfs for them to wear! As a teacher and child care provider I find it fascinating to see the children in my care grow up and find their way. When Kyle was a little boy he absolutely LOVED trains. As providers we encouraged his interest, as did his parents. To see him grow up and gain the education needed to pursue his interest as a career is nothing short of amazing! There are not many train engineer jobs available and we’re so very proud Kyle was able to make a career doing what he loves most. What a huge success! Thanks again to Kyle! The kids loved his visit and as a former student, he is always welcome to come for a visit.